Samsung is rumored to launch the Galaxy M series in the coming months. The new series is expected to replace the current Galaxy J, Galaxy On, and Galaxy C series devices in the company’s lineup. All the leaks and reports so far point to three new Galaxy M models in development: SM-M105F, SM-M205F, and SM-M305F, rumored to launch as the Galaxy M10, M20, and M30 respectively. In our exclusive reports, we have already reported color and storage options for these upcoming devices. One of them, the SM-M305F, aka the alleged Galaxy M30, has now appeared on the Geekbench website, revealing some of its middling specifications. 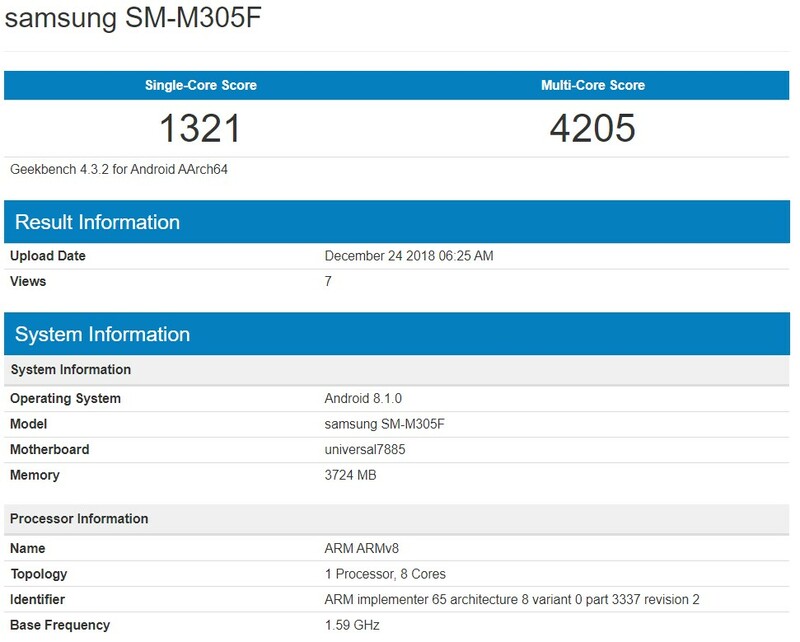 As per the Geekbench listing, the Galaxy M30 will be powered by an Exynos 7885 SoC with 4GB of RAM and Android Oreo 8.1 onboard. From our earlier report, we also know that the Galaxy M30 will come in 64 GB and 128 GB storage variants. Samsung has already started rolling out the Android 9.0 Pie update to the Galaxy S9/S9+. It will be disappointing if the company launches these Galaxy M devices a few months later with the older Android Oreo onboard. As it is common for companies to develop and test prototypes with older components and software, there is still a possibility for the Galaxy M30 to launch with better specs and updated software. The upcoming Galaxy A50 was spotted with Android Pie after all. For now, the listed specs don’t appear very different from current Galaxy mid-range (and some recent budget) devices. The Exynos 7885 powered the Galaxy A8 and Galaxy A8+ and also powers the Galaxy M20, so Samsung may be moving to the Exynos 9610 for next year’s A series phones. It does make us wonder if there is anything else these phones might offer to stand out in the crowded budget market. Pricing will define their success more than anything else, but details on that are currently unavailable.